Of the two months we spent in Vietnam a good portion of that was riding everyday. 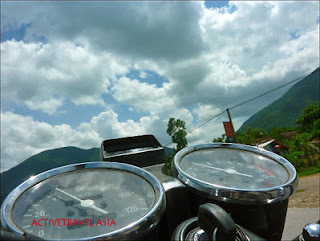 We booked a Motorbiking the Ho Chi Minh Trail tour of Activetravel Asia. Our tour is about 3500km from Hanoi to Saigon (much to the horror of our parents!). We took our time, made many small stops in towns as well as major cities and really got a feel for Vietnam. Along the way we met so many travellers who were shocked, awed, surprised and inspired by what we were doing and many a times the question they all asked was ‘Is it safe?’ Every time without fail our answer was‘Yes!’. There were of course many things that made our trip more not only safe but more enjoyable. If you’re considering doing the same thing we did or even just hiring a bike for a few days, read these 6 tips below on how to make your trip as safe as possible. Riding a motorbike in Vietnam (or any vehicle in South East Asia for that matter!) is very different to what you may be used back at home. The first thing you should know is that while road rules do exist, when on the road they cease to exist-if you get my drift! Forget trying to indicate, using your mirrors or going the speed limit-it just doesn’t happen. At first this may take some getting used to but after a while it works. So many times we would see Vietnamese on their Moto’s pulling out of a road onto a major highway without even looking! It’s just a given that everyone moves around them or out of their way. Now while I’m not saying you should never look when pulling out (a lot of things you’ll still do instinctively) but rather you need to flex your rules to how the Vietnamese do things. For example, while Anthony was riding, if we needed to cross lanes, merge, turn or even slow down I would just stick my hand out (either left or right depending which way) and give it a little shake. Who needs indicators when you have a good old hand wiggle! The thing is, it worked. People knew where we were trying to go. It might seem a little awkward at first, trying to adapt but after a while their driving becomes second nature. This is probably one of the most important things you can do whilst on a bike. When you first get on, you make feel like you want to go slow (because it feels safer) but in all honesty, doing that will get you into an accident. In larger cities-because there are so many motorbikes-there is an ebb and flow to the traffic. Keeping up with this so called ‘pulse’ makes it easier to move on the road. If you’re travelling on major highways, always keep to the very edge of the road and try and go about 60km/h. It’s unlikely you’ll be able to go any faster and going slower is likely to cause more accidents. If you’re on the road for most of the day (we only ever tried to ride about 3-4 hours a day MAX), it is important to stop for tea breaks. Along both main and country roads there are countless teahouses that will offer you an ice-cold cup of ‘tra da’ (iced tea) for less than a dollar. Many of these places will also serve a soup or a rice dish too if you’re hungry. These stops are important so you can stretch your legs and have a bit of a break from riding, but they are also a great place to meet locals, have a chat with them and get a view into their daily life. Now while it may sound adventurous and rather ‘Bear Grylls’ of you to travel without a map, it is smarter idea to carry one with you on your trip. Not only can you decide where you want to ride to next, you can also pick and choose places a little more easily. We bought maps that were detailed, had how many km’s there was between towns and also had tourist sites for some places. Road signs are actually pretty good in Vietnam and many places/roads were labeled and corresponded to our map. On the off chance they didn’t, or we weren’t sure where we were going, we just pulled up somewhere and asked the locals for some help. We would show them the town on the map and then they would point us in the right direction. Everyone we met was willing and happy to help (so boys, don’t worry about asking for directions!) 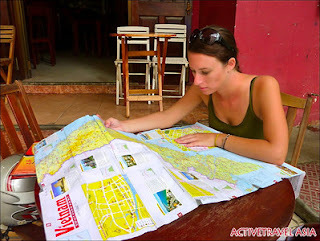 Not only will a map help keep you safe it is also great to keep check of everywhere you visited in Vietnam. When you can, take the back roads to your next stop. Not only will they allow you travel slower and be less crowded, but more often than not the sights are breathtaking and the people very friendly. Running pretty much the entire length of the country is Highway 1. It’s busy, dusty and very fumy. However, to get to coastal towns, there are times when you’ll have to travel on this. Otherwise opt for the scenic and beautiful, Ho Chi Minh Trail. This road is very quiet, smooth and much more pleasant. Take your time and travel these smaller quieter roads, wherever possible. Riding at night is ok if you’re just going out to eat or visit markets etc, but try not to travel at night on your bike. Many of the roads have no streetlights, so at night it is more difficult to see what may be ahead of you. There are many dogs, chickens, cows they are constantly on the road, so running into one of them on the road wouldn’t be pleasant or safe. Also, some Vietnamese don’t travel with their headlights on which makes them harder to see. The bottom line-don’t travel at night for a long period of time. 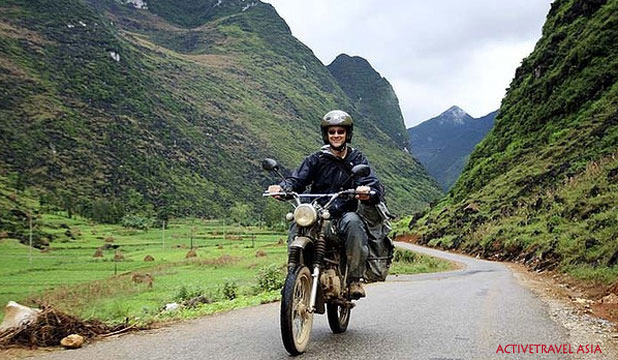 With these tips in mind, get out there are enjoy riding through Vietnam! You now have the freedom to go wherever and whenever you’d want. Stumbling upon little towns you never thought existed or meeting some of the friendliest people in the world, will surely be an amazing experience. It is hands down the highlight of my trip so far and I know Anthony feels the same. Hopefully you’ll enjoy it just as much as we did! 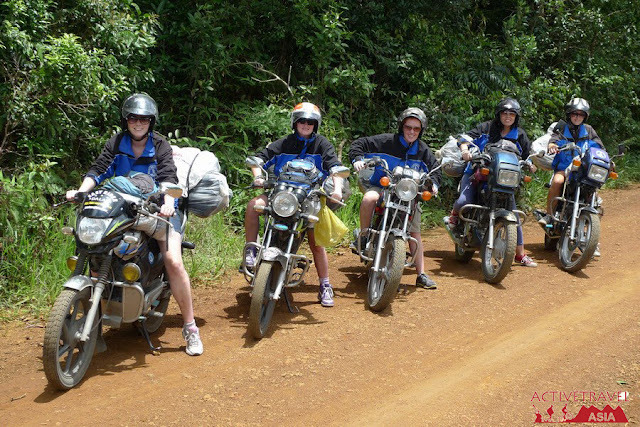 Recommend an itinerary Motorbiking the Ho Chi Minh Trail - Complete Challenge of Activetravel Asia.